Thanks to the integration of Apple HomeKit, the Nuki Smart Lock 2.0 makes it even easier to integrate your electronic door lock into your Smart Home system. This lets you connect your Smart Lock directly to your Philips Hue lamps and intelligent heating controls. With Siri, you can control the whole thing via simple voice commands and in the evening all you have to say is “Hey Siri, good night!” and your door locks, the shutters close, the heating is set to a comfortable sleeping temperature and the light switches off. In the evening you will never again have to worry about whether you turned everything off and can just relax and drift off to sleep. It is also very easy to display notifications with HomeKit. Doing so means you will always know right away when a certain user unlocks your Smart Lock without having to look into the log. Do things need to go a little faster in the morning again? Let the intelligent scenes quickly brew your coffee, tell you how long it will take to get to work and what your next appointments are, then unlock the door so you can make it to the bus on time! Your partner doesn’t have an iPhone? No problem! 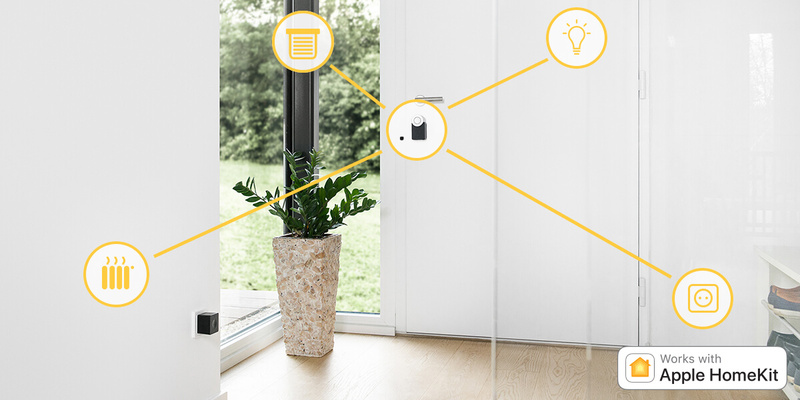 The Nuki Smart Lock is the first Smart Lock in Europe that can simultaneously be integrated into HomeKit while still offering all its functions to Android users via the Nuki App. Integrating your Nuki Smart Lock into HomeKit is just as easy as with the other HomeKit-enabled Smart Home devices that you are familiar with. All you need to do is open the Home App on your iPhone or iPad and then scan the HomeKit QR code. This is located on the underside of your Smart Lock as well as on the small insert with the HomeKit logo on it. Then all you have to do is assign your electronic door lock to a house and a room and the installation is complete. From now on you can easily link your Nuki Smart Lock with your other HomeKit devices. In which scenes would you like to include your HomeKit-enabled Nuki Smart Lock 2.0? Tell us on our Facebook and Twitter channel!